At the end of the last blog, we had made some progress in removing the coffee cup stain from the image, but we needed to do more. Adaptive thresholding has started to separate the writing from the stain, but it has also created a speckled pattern within the stains. We need to engineer a feature that can tell apart a stroke of writing from a speckled local maxima i.e. distinguish a ridge from a peak in the 3D surface. In image processing, we do this via edge detection, which is the process of calculating the slope of the 3D surface of the image, and retaining lines where the slope is high. 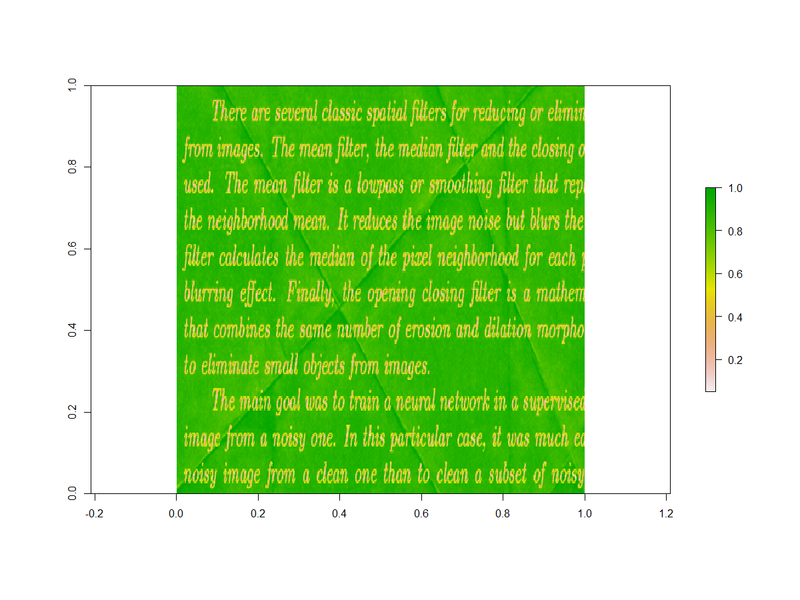 There are several different standard algorithms to do edge detection, and today we will use the canny edge detector. Note: we dropped jpeg and tiff IO functions. Download (go to the DLL’s page then download the raw file) libfftw3-3.dll, libfftw3f-f.dll, libfftw3l-3.dll, and zlib1.dll to C:\Program Files\R\R-3.x.x\bin\x64 (x.x needs to be edited) or somewhere present in the PATH variables. Make sure that the downloaded dll files are MB in file size. Download biOps_0.2.2.zip (go to the DLL’s page then download the raw file). Make sure that the file size is around 700KB. That’s because I had downloaded biOps_0.2.2.zip into the C:/Program Files/R/R-3.1.3/bin folder. You should substitute the folder path that you downloaded the zip file into. Update!!! : Google has switched off Google Code. But I have found the dlls inside an archive that you can download from here. Warning: the download is large (613.91MB). Now we can start to experiment with edge detection. Note that biOps images have pixel brightnesses from 0 to 255 rather than from 0 to 1. So we have to rescale whenever we switch packages. To take advantage of these observations we shall use image morphology. 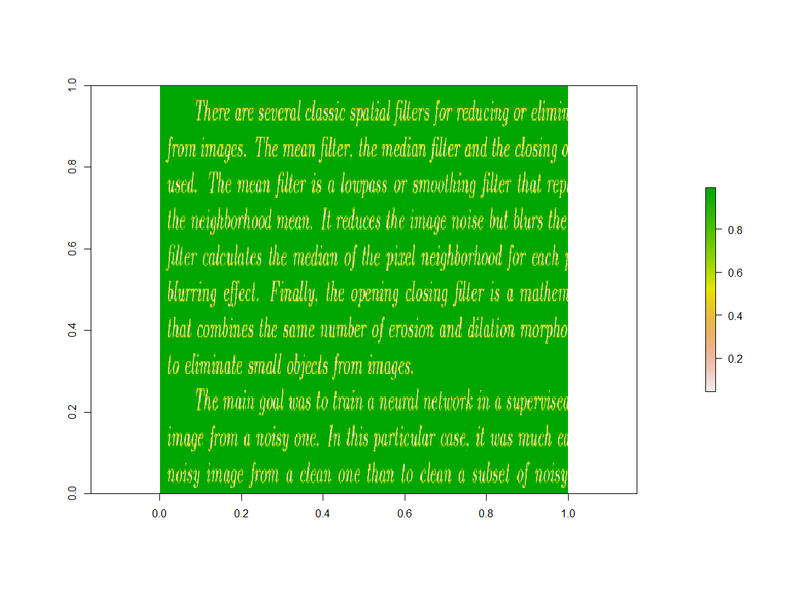 Dilation is the process of making a line or blog thicker by expanding its boundary by one pixel. 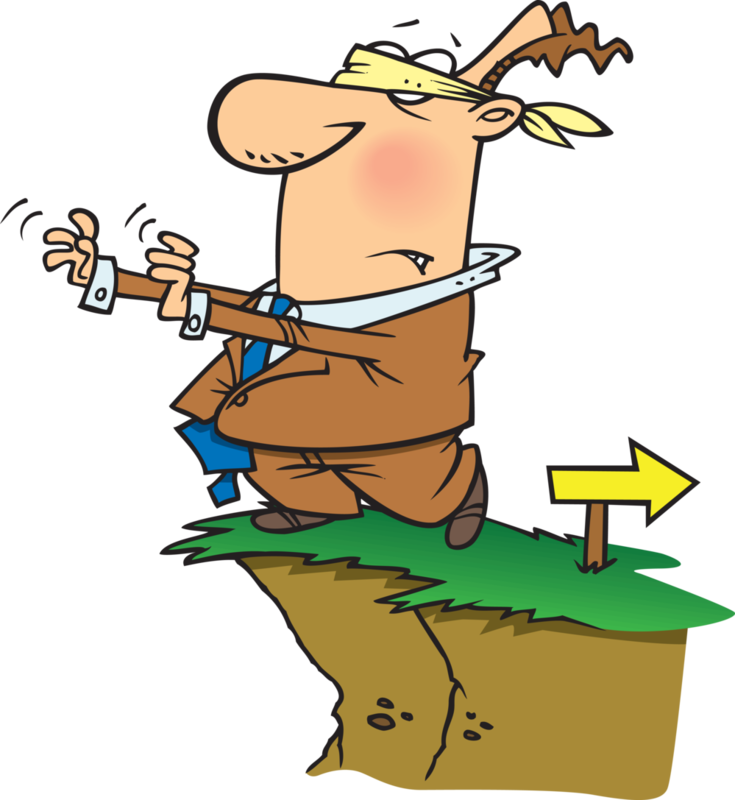 Erosion is the opposite, removing a 1 pixel thick layer from the boundary of an object. If we dilate the edges, then the pair of edges around the writing will expand to include the writing inside, and the edge of the stain will also expand. The writing is all black, whereas most of the stain is white. This will probably be a useful feature for removing the coffee cup stain. But we can do more: now that we have dilated the edges, we can erode them to remove where we started with single edges. This looks pretty good – all of the writing is black, but only a small part of the stain remains. the stain has a thin line, while the writing has thick lines. So we can erode once, then dilate once, and the thin lines will disappear. The stain is now almost completely removed! But unfortunately some of the writing has been removed too. So it is an imperfect feature for removing the coffee cup stain. dirtyFolder = "C:\\Users\\Colin\\dropbox\\Kaggle\\Denoising Dirty Documents\\data\\train"
cleanFolder = "C:\\Users\\Colin\\dropbox\\Kaggle\\Denoising Dirty Documents\\data\\train_cleaned"
outFolder = "C:\\Users\\Colin\\dropbox\\Kaggle\\Denoising Dirty Documents\\data\\train_predicted"
# what score do we get on the training data? The model doesn’t completely remove the coffee cup stain, but it has faded the stain enough that we have a good chance at removing it later. In the next blog in this series, we will do more to clean up the coffee cup stain. In my last blog, I discussed how to threshold an image, and we ended up doing quite a good job of cleaning up the image with the creased paper. 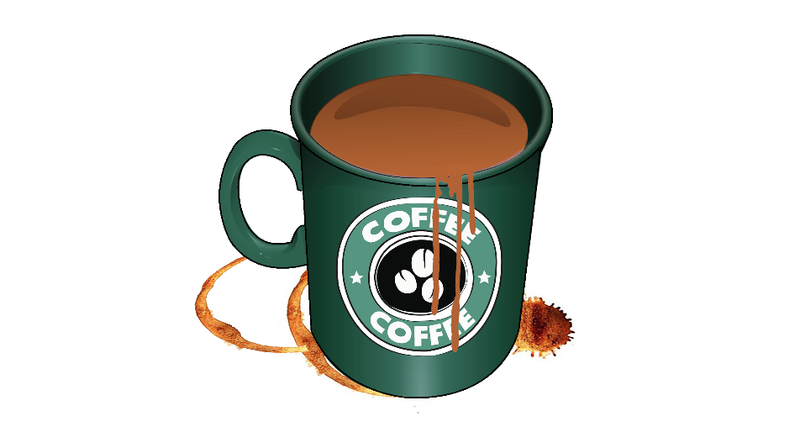 But then I finished the blog by showing that our algorithm had a problem, it didn’t cope well with coffee cup stains. The problem is that coffee cup stains are dark, so our existing algorithm does not distinguish between dark writing and dark stains. We need to find some features that distinguish between dark stains and dark writing. So we can hypothesise that we might be able to separate the writing from the stains by using thresholding that looks at the pixel brightnesses over a localised set of pixels rather than across all of the image. That way we might separate the darker writing from the dark background stain. 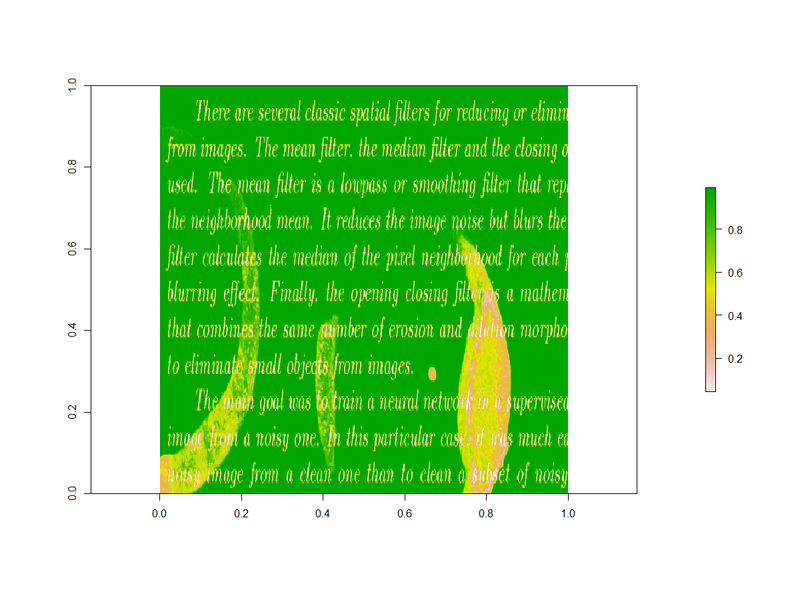 While I am an R programmer and a fan of R, I have to admit that R can be a frustrating platform for image processing. For example, I cannot get the adimpro package to work at all, despite much experimentation and tinkering, and googling for solutions. Then I discovered that the biOps package was removed from CRAN, and the archived versions refuse to install on my PC. But eventually I found ways to get image processing done in R.
First, I tried the EbayesThresh package. All of the values are zero! That isn’t very helpful. Second, I tried the treethresh package. Once again I only got zeroes. Finally, I tried wavelet thresholding using the treethresh package. It wasn’t what I was looking for, but at least it’s not just a matrix of zeroes! After these two failures with CRAN packages, I decided that I needed to look beyond CRAN and try out the EBImage package on Bioconductor. These images show that we are on the right track. The adaptive thresholding is good at separating the letters from the background, but it also adds black to the background. While the adaptive thresholding may not be perfect, any feature extraction that adds to our knowledge will probably improve our ensemble model. 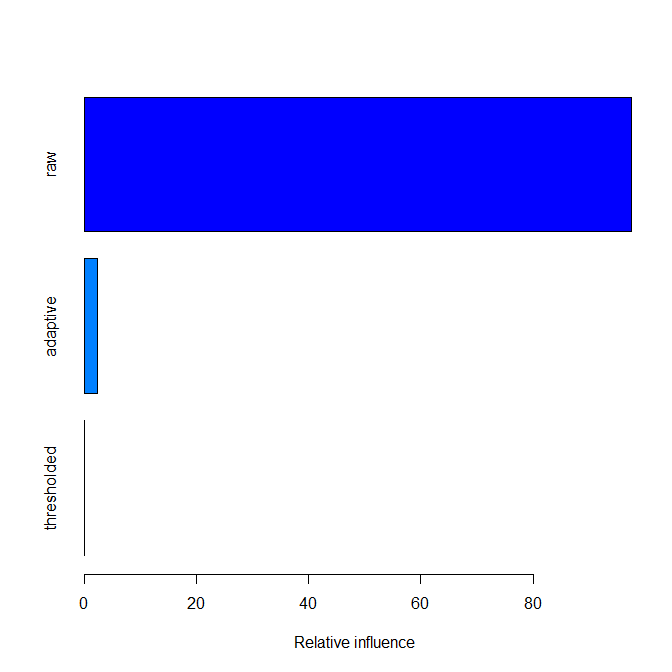 Before we add adaptive thresholding to our model, we will do a bit more pre-processing. Based on the observation that adaptive thresholding is keeping the letters but adding some unwanted black to the background, we can combine all of the adaptive thresholding with normal thresholding images, and use the maximum pixel brightness across each 5 image set. It’s starting to look much better. The coffee cup stain isn’t removed, but we are starting to successfully clean it up. This suggests that adaptive thresholding will be an important predictor in our ensemble. Let’s bring it all together, and build a new ensemble model, extending the model from my last blog on this subject. The adaptive thresholding gets a relative importance score of 2.4%, but full image thresholding loses all of its importance in the model. The result may not be perfect, but you can see how the coffee cup stain is starting to be erased. We will need to find some more features to continue the clean up, but that will be left to future blogs. This blog’s model has improved the RMSE on the training data from 6.5% reported in my last blog to 5.4% in this latest version. There’s a long way to go to have a top 10 performing model, but this process is steadily moving us in the right direction. 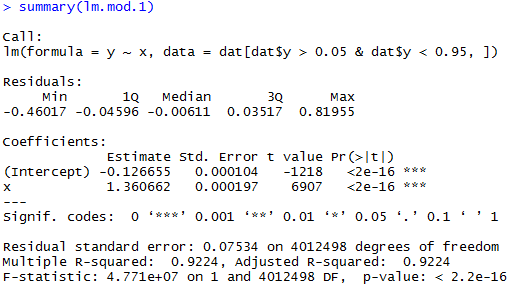 In the first blog in this series, I explained the nature of the problem to be solved, and showed how to create a simple linear model that gives an RMSE score on the training data of 7.8%. In this blog I introduce the feedback loop for creating features, and we extend and improve the existing competition model to include a couple of new features. I have been building machine learning models for almost 20 years now, and never once has my first model been satisfactory, nor has that model been the model that I finally use. The Denoising Dirty Documents competition is no different. In the plots above, you can see my progress through the public leaderboard, as I iteratively improved my model. The same has occurred more broadly in the competition overall, as the best score has iteratively improved since the competition began. So we have completed one cycle. Now we need to do another cycle. 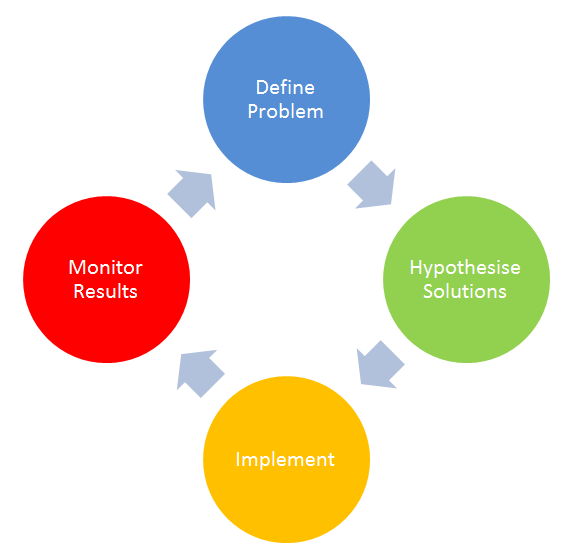 Now we can progress to the beginning of the next cycle, the Define the Problem stage. This time the problem to be solved is to remove one or more of the errors from the output of the existing model. Once we already have a model, we can define the problem by asking ourselves the following question. Question: In the predicted image, where have prediction errors have been made? Answer: The predicted image contains some of the crease lines. So in this cycle, the problem is to remove the remaining crease lines. In the dirty image, what is a single characteristic of what we want to keep or remove that we haven’t captured in our existing model? What characteristics do the errors in the predicted image have? What characteristics does the dirty image have at the locations where these errors occur? In the dirty image, the writing is darker than the background around it. We haven’t captured this locality information. The predicted image retains some of the crease lines. Those remaining crease lines are narrower and not as dark as the writing. In the dirty image, the shadows next to the white centres of the crease are the remaining crease lines from the predicted image. This led me to the hypothesis that the model for a single pixel needs to include information about the brightness of other pixels in the image. There are multiple ways that we could consider the brightnesses of other pixels, but in today’s blog I will limit myself to considering the brightness of the pixel under consideration versus the range of pixel brightnesses across the entire image. The machine vision technique that I will apply this today is thresholding, which is the process of turning an image into pixels that can only be black or white, with no grey shades or colours. Writing code to do thresholding is the easy part. The trickier part is to decide the threshold value at which pixels are split into either black or white. One way of finding a threshold value is to look at a histogram of the pixel brightnesses and look for a natural break between local maxima in the histogram. Since the histogram above is tri-modal, this would leave us with two choices of thresholds, one around 0.3 and one around 0.65. Now we can Monitor Results. 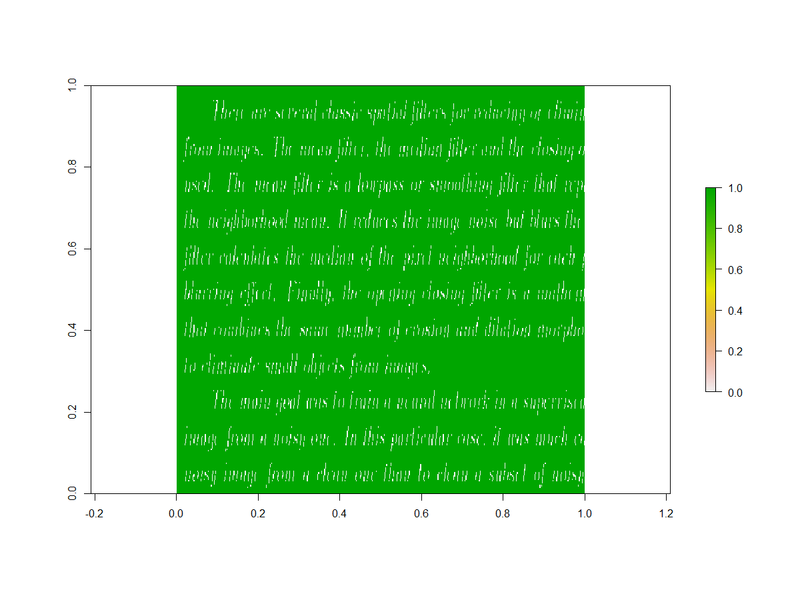 Thresholding at 0.3 gives us no false positives for this image, but leaves out a lot of the writing. Thresholding at 0.65 gives us no false positives for this image, and correctly flags the writing without flagging the creases. That makes it quite a good feature for use on this image, as it will help us to remove the residual crease mark that we found when reviewing the output of the last blog’s model. We should definitely include a thresholding feature in our model! 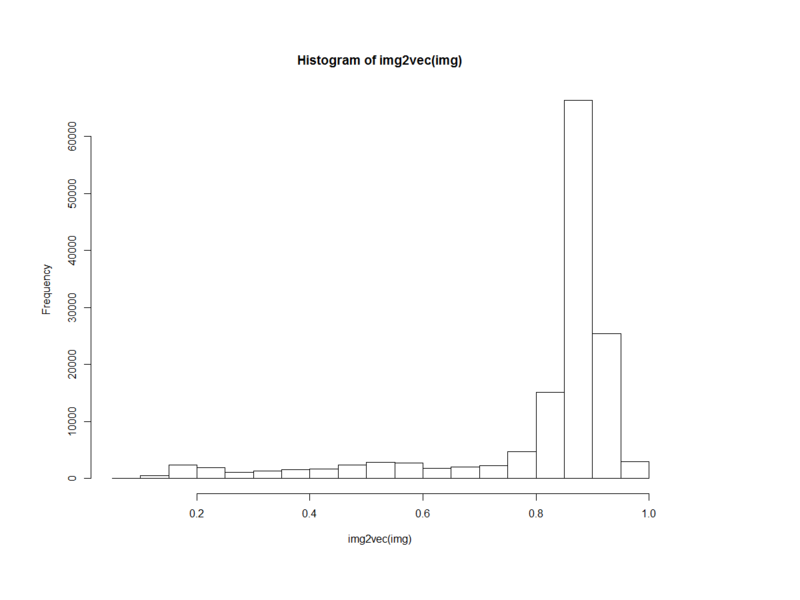 But it feels very clumsy to plot a histogram and manually select the threshold, and such a feature definitely isn’t “machine learning”. Can we automate this? Otsu’s Method is a well-known technique in image processing that can automatically suggest a threshold. 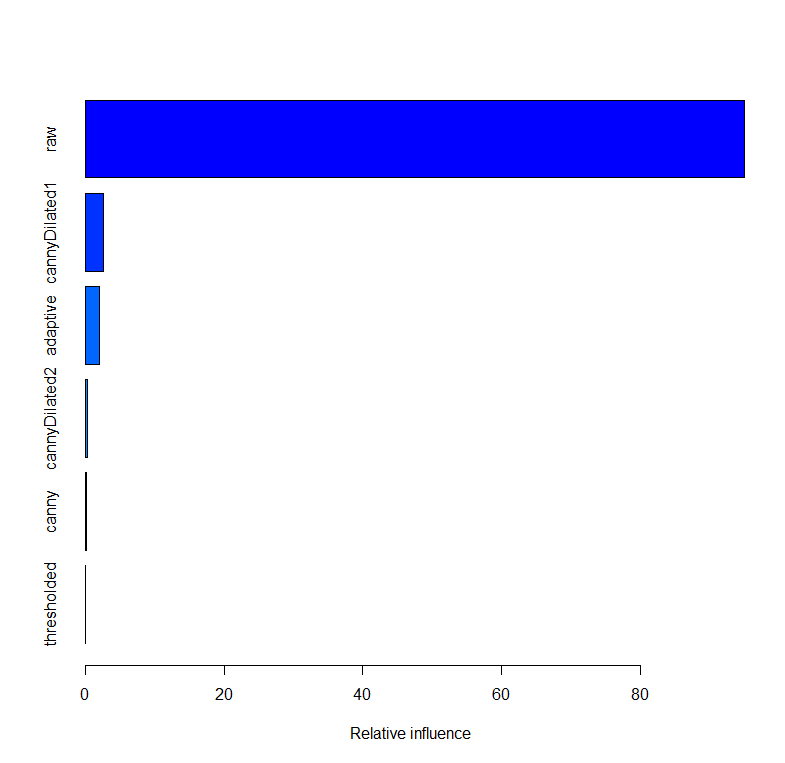 But it assumes a bi-modal histogram, which we have seen is not true. 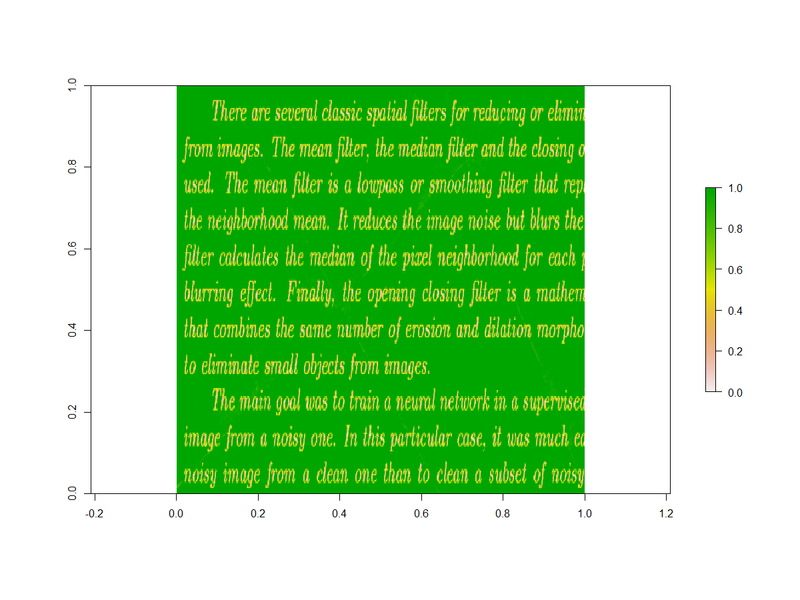 Inspired by Otsu’s method, we could use cluster analysis to generate three clusters of pixel brightnesses, and use the splits between those clusters to threshold the image. Now we can Monitor Results. Once again, the lower threshold choice doesn’t capture enough of the writing, while the upper threshold choice works well for this image. And this time there wasn’t any manual work required! Let’s put it all together and combine last blog’s feature (a linear transformation of the raw pixel brightnesses) with this blog’s feature (thresholding). 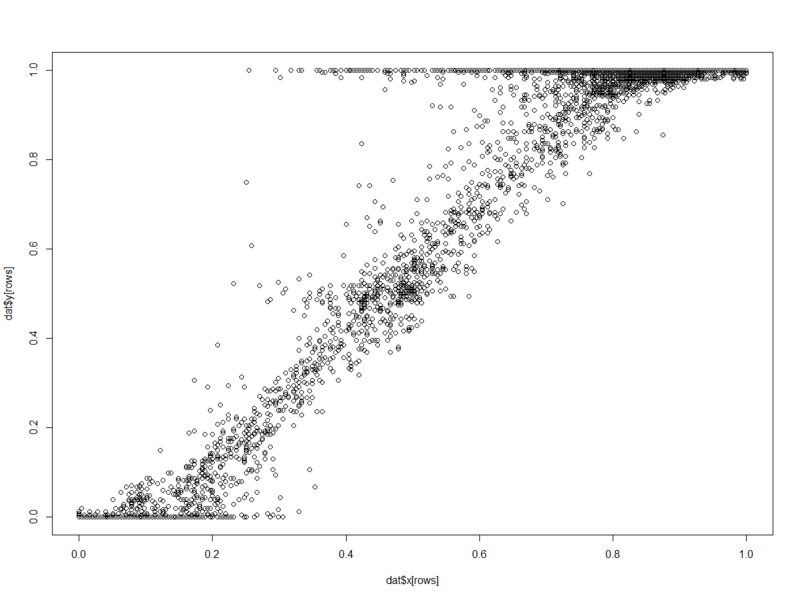 This time we will use something more sophisticated than linear regression. Our model will be based upon R’s GBM package, a gradient boosted machine to combine the raw pixel brightnesses with the thresholded pixels. GBMs are good all-purpose models, are simple to set up, perform well, and are almost always my first choice when creating machine learning models. dirtyFolder = "C:\\Users\\Colin\\Kaggle\\Denoising Dirty Documents\\data\\train"
cleanFolder = "C:\\Users\\Colin\\Kaggle\\Denoising Dirty Documents\\data\\train_cleaned"
outFolder = "C:\\Users\\Colin\\Kaggle\\Denoising Dirty Documents\\data\\train_predicted"
Notice how the sample output image is different from the thresholded image? The edges of the writing are lighter than the centre of the letters. That’s good, because that’s one of the characteristics of the clean image. The sample image that we created from the predicted values is looking really good. The residual crease marks have disappeared, yet we have kept the writing. And the RMSE score on the training data has improved to 6.5%. Damn! I feel like cursing the jerk who put their coffee cup on top of the important document and left a stain! In my next blog, I will discuss the first steps towards removing that coffee cup stain. I recently blogged about my learning curve in my first Kaggle competition. This has become my most popular blog to date, and some readers have asked for more. 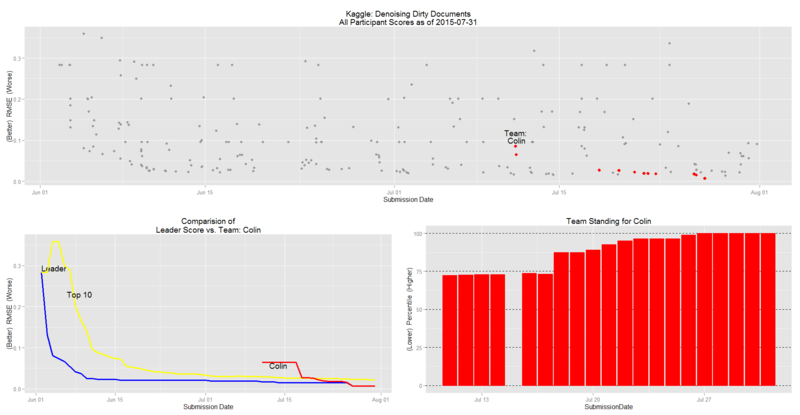 So this blog is the first in a series of blogs about how to put together a reasonable solution to Kaggle’s Denoising Dirty Documents competition. Some other competitors have been posting scripts, but those scripts are usually written in Python, whereas my background makes me an R programmer. So I will be writing scripts that make use of R.
We have been given a series of training images, both dirty (with stains and creased paper) and clean (with a white background and black letters). We are asked to develop an algorithm that converts, as close as possible, the dirty images into clean images. A greyscale image (such as shown above) can be thought of as a three-dimensional surface. The x and y axes are the location within the image, and the z axis is the brightness of the image at that location. The great the brightness, the whiter the image at that location. So from a mathematical perspective, we are being asked to transform one three-dimensional surface into another three dimensional surface. 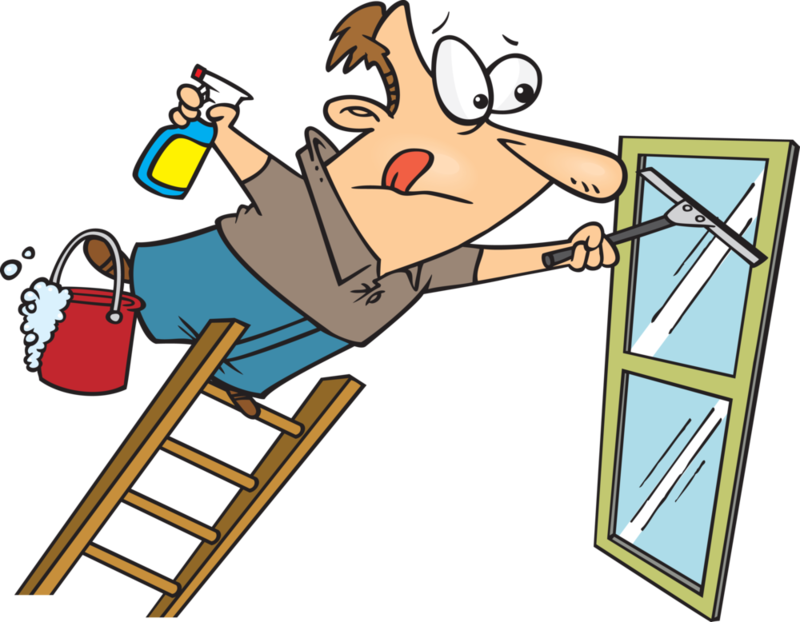 Our task is to clean the images, to remove the stains, remove the paper creases, improve the contrast, and just leave the writing. In R, images are stored as matrices, with the row being the y-axis, the column being the x-axis, and the numerical value being the brightness of the pixel. Since Kaggle has stored the images in png format, we can use the png package to load the images. 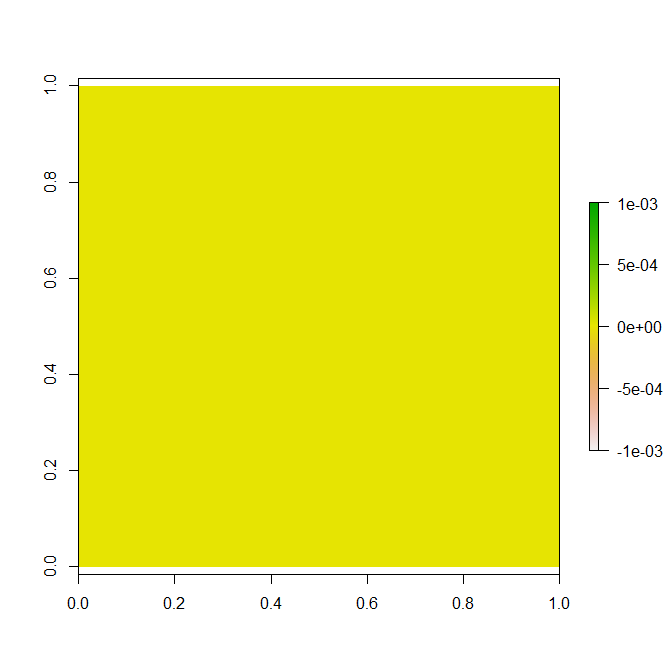 You can see that the brightness values lie within the [0, 1] range, with 0 being black and 1 being white. Instead of modelling the entire image at once, we should predict the cleaned-up brightness for each pixel within the image, and construct a cleaned image by combining together a set of predicted pixel brightnesses. We want a vector of y values, and a matrix of x values. 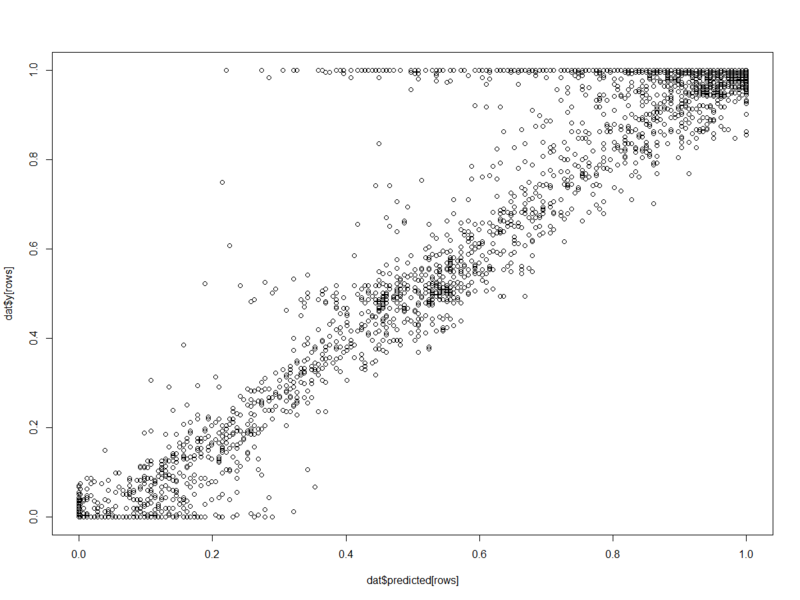 The simplest data set is where the x values are just the pixel brightnesses of the dirty images. The data is now in a familiar format, which each row representing a data point, the first column being the target value, and the remaining column being the predictors. Look at the relationship between x and y. Except at the extremes, there is a linear relationship between the brightness of the dirty images and the cleaned images. There is some noise around this linear relationship, and a clump of pixels that are halfway between white and black. There is a broad spread of x values as y approaches 1, and these pixels probably represent stains that need to be removed. So the obvious first model would be a linear transformation, with truncation to ensure that the predicted brightnesses remain within the [0, 1] range. That’s quite good performance for a simple least squares linear regression! To be fair though, I deliberately chose an example image that performs well. In my next blog in this series, I will discuss the use of a feedback loop in model design, and how to design new features to use as predictors. 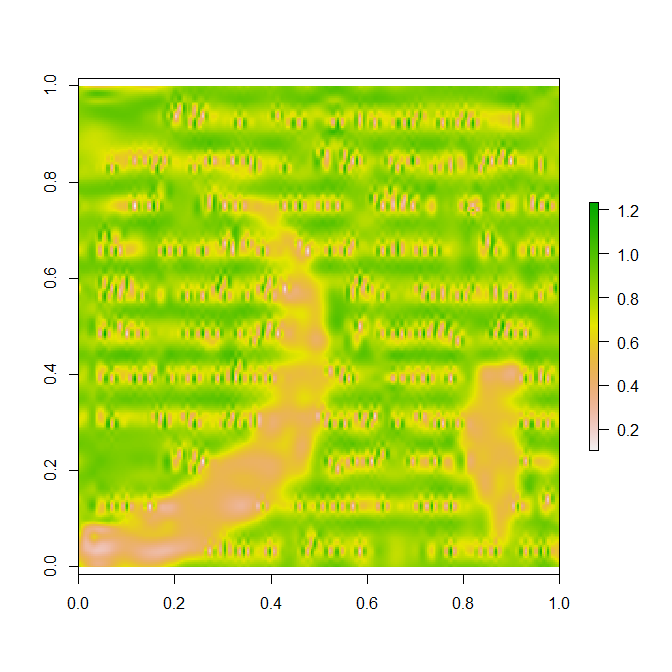 This month I started competing in my very first Kaggle competition, Denoising Dirty Documents. I was first introduced to Kaggle a few years ago by Xavier Conort, an insurance industry colleague who also lives here in Singapore. But I had been passive with my Kaggle membership, and hadn’t even considered competing. This year two things changed. Firstly, I joined IntelliM, an image processing, machine learning and software house, and I needed to get out into the real world and make business connections and start adding value in these fields. Secondly, Kaggle opened the Denoising Dirty Documents competition, which is about pre-processing scanned documents so that they are suitable for optical character recognition, and this competition required both image processing skills and machine learning skills. So this competition looked like a great match for me, and hopefully would be an easy transition to build some experience within Kaggle. Although I am an actuary by training, I have not always stayed within the traditional bounds of actuarial work. Back in the 1990s I first started playing with machine learning, using neural networks to predict which customers will renew their insurance policies. Then, inspired by Kim and Nelson’s book, I developed a state space regime switching model for predicting periods of massive builder insolvencies. That model has subsequently been adapted for cancer research, to measure the timing of genes switching off and on. 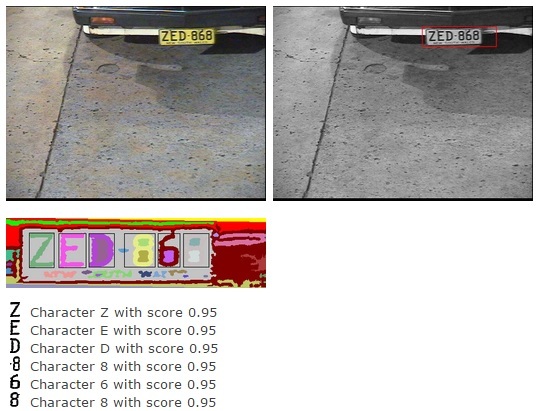 In the 2000s I started getting involved in image processing, firstly to create optical character recognition for a web scraper software package, and later developing COPR, license plate recognition software. Over the past decade I have been using machine learning for customer analytics and insurance pricing. Machine learning is sometimes called artificial intelligence. After all, aren’t neural networks based upon the architecture of the human brain? My first competition submission was a pure machine learning solution. I modelled the target image one pixel at a time. For predictors, I got the raw pixel brightnesses for a region around each pixel location. This is a brute force approach that I have used in the past for optical character recognition. I figured that the machine learning algorithm would learn what the character strokes looked like, and thereby know which pixels should be background. What really happened was that the machine learning algorithm simply adjusted the brightness and contrast of the image, to better match the required solution. So I scored 8.58%, giving me 24th ranking, much higher than I was expecting, and much closer to some naive benchmarks than I was comfortable with. I wanted a top ten placing, but I was a long way away from it. So I fine-tuned the model hyperparameters. This moderately improved the score, and only moved me up 3 ranks. My next competition submission actually scored far worse than my preceding two submissions! I needed to rethink my approach because I was going backwards, and the better submissions were almost an order of magnitude better than mine. The reason my submission scored so poorly was because I was asking the machine learning model to learn complex interactions between pixels, without any guidance from me. There are heuristics about text images that I intuitively know, but I hadn’t passed on any of that knowledge to the machine learning algorithm, either via predictors or model structure. My algorithm wasn’t artificially intelligent; it was artificially stupid! what is it about the text that is different to the background? what are the typical characteristics of text? what are the typical characteristics of stains? what are the typical characteristics of folded or crinkled paper? how does a dark stain differ from dark text? what does the output from a image processing algorithm tell me about whether a pixel is text or background? what are the shortcomings of a particular image processing algorithm? what makes an image processing algorithm drop out some of the text? 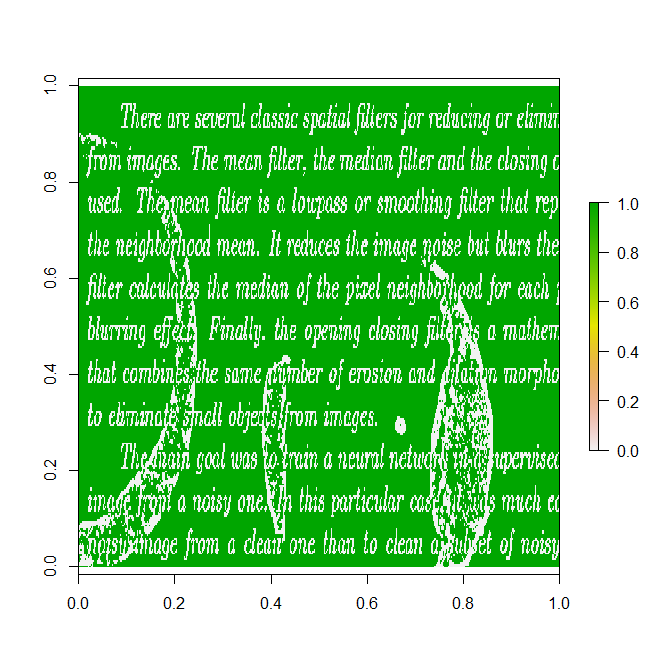 what makes an image processing algorithm think that a stain is text? 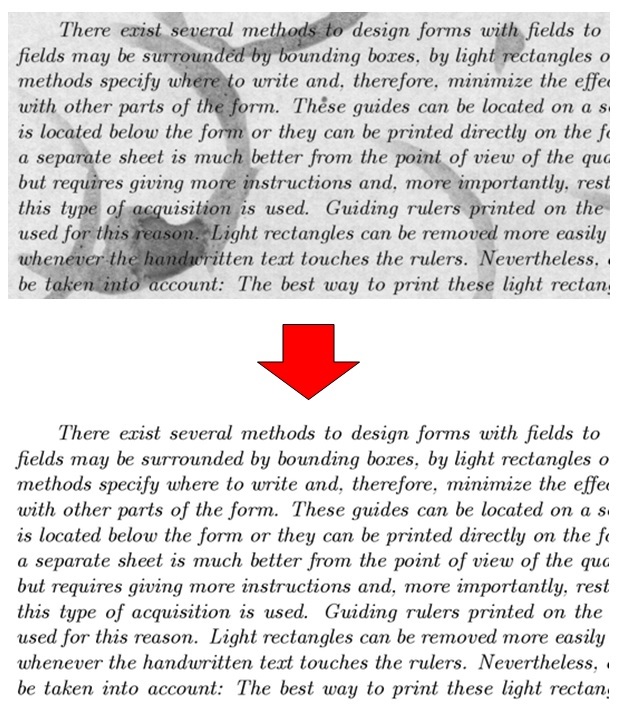 what makes an image processing algorithm think that a paper fold is text? which algorithms have opposing types of classification errors? For example, in the image above, the algorithm thins out the text too much, does not remove the outer edges of stains, and does not remove small stains. That prompted me to think that maybe an edge finding algorithm would complement this algorithm. Kaggle is addictive. I can’t wait to solve this problem!